Nobody releases wines faster than the Wagner Family of Wines which oversees Caymus, Conundrum, Mer Soleil, Belle Glos, and Meiomi. 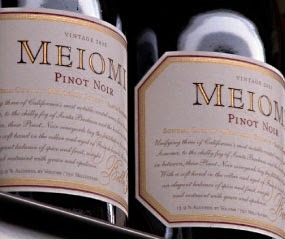 Before we've had a chance to fully pin down 2012 California Pinot Noir here comes the 2013 Meiomi. Meiomi is a blend of grapes sourced from regions of California known for Pinot Noir production: Monterey, Sonoma, and Santa Barbara. Belle Glos (~$44) is the Wagner Family's single vineyard label (Las Alturas, Clark & Telephone, Taylor Lane, Dairyman) but don't be mistaken: Meiomi (~$22) isn't necessarily a blend of grapes from these vineyards. Meiomi is it's own thing. And given production levels north of 150,000 cases it's not necessarily the kind of wine I'm looking for vintage variation with. At this price point I'm looking for a wine that's reliably delicious that I can be assured will deliver a similar experience time after time. Aromatically fresh and quite delicious. Although the flavor profile is quite ripe, this vintage - like others that proceed it - steers deftly clear of veering into over-ripe territory. At a reasonable 13.8% alcohol it doesn't derive its flavor through alcohol levels. Intensity of flavor is derived from fruit. For a no-brainer easy drinking weeknight wine, this is a winner. If you like Meiomi I think you'll love the 2013. If you like fruit-forward domestic Pinot Noir I think this deserves a slot in the rotation as a daily drinker. Is it ripe even for California Pinot Noir? Definitely. But for me it doesn't cross the line and this is another winner. You can find Meiomi by the glass at restaruants in the $9-$14 range. If you're into deals here's how to buy the wine for just $12.99 a bottle.